A performance artist has rolled across London singing "We wish you a merry Christmas" because he wants to spread the message to be kind to cleaners. Mark McGowan, 37, from Peckham, rolled from Elephant and Castle in south London to the Bethnal Green Road in east London. He began the four and half mile roll at 1000 GMT on Friday and arrived at 'Gallery 1,000,000 mph' at 1830 GMT. The artist suffered bruises to the knees and ankles but said: "It was definitely worth it and I'm feeling emotional - it's been unbelievable. "Lots of artists have been called mad in the past, I'm just going join a long line of them." He added that his "next performance will be as a doormat." The concept of the performance is based on Mr McGowan's experience of cleaning an office when he says he never received a "kind comment or a thank you". He said: "I never missed a day's cleaning, but even at Christmas there was no 'have a happy Christmas' written in the comment book. "This performance is in response to the feelings of resentment I have towards the people of that office whose only thoughts were to criticise my cleaning." 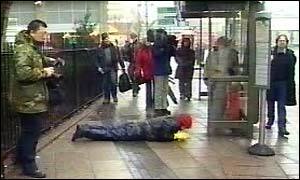 In May 2001 Mr McGowan crawled on his hands and knees from Peckham to Camberwell without any preparation. He found he performs better if he does not practice beforehand. He said the inspiration for his latest event came from an Indian man who rolled 2,400 miles across India and became known as the Rolling Saint. Mr McGowan did not wear any protective clothing for the task but kept a raincoat on due to the weather. He also wore a pair of rubber gloves to represent all cleaners. "Mark McGowan is on a roll and will be for the rest of the day"